Nostalgia won't save the NHS from the encroachment of market forces - only a broad-based mass movement can do that. 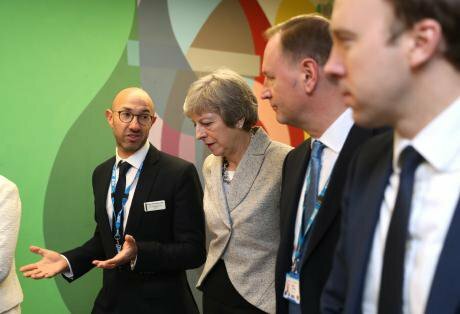 Image: Theresa May, NHS boss Simon Stevens and new Health Secretary Matt Hancock vist a health centre in North London in November 2018. Credit: PA Images/Andrew Matthews. Since the first edition of How to Dismantle the NHS in 10 Easy Steps, we’ve had the junior doctors' strike, the Conservative victory in the 2015 general election, the Corbyn phenomenon, the unexpected Brexit vote and the arguably even more unexpected loss of the Conservative majority in 2017. In the months that followed the publication of my book in 2015, I found myself embarking on a journey that I had scarcely even contemplated when I set out to write it. Only weeks after publication, I was given a life-threatening diagnosis at the age of 34 and underwent several months of intensive treatment. Fortunately I went on to make a good recovery, all thanks to the NHS. From fighting to save the NHS, the NHS saved my life. One dreads to think of the financial costs of such treatment in a private insurance system. A 2009 Harvard University study found that the majority of personal bankruptcies in the US - over a whopping 60% - were due to healthcare costs. At the outset of my illness, 50,000 junior doctors initiated strike action in protest at the government imposition of a new contract. It would turn out to be the largest industrial action of the 21st century in the UK. I even found myself addressing a large crowd in Parliament square just a day after receiving the first dose of my treatment. I had expected to be laid up in bed that weekend, but perhaps the mobilisation of my colleagues had served to invigorate me (I may have overdone it because things went downhill for the rest of that week!). The junior doctor struggle was historic, even if it ended with a whimper rather than a bang. Of course, the lessons of this failure - some of them difficult to confront - must be evaluated if we are to rescue a publicly funded, run, owned and accountable NHS. There have certainly been times at which I have doubted my own analysis. That surely the government cannot be dismantling our precious, cherished NHS. Yet nostalgia will not be sufficient to salvage the NHS from the encroachment of market forces and the logic of capitalism. (Incidentally, the phrase - dismantling the NHS - appears to have entered the lexicon). I was saddened yet unsurprised to find my predictions coming true one by one – the redesign of the workforce through the new junior doctor contract offering worse pay and conditions, the withdrawal of the student nursing bursary, the creation of economies of scale through chains of super hospitals and networks of GP surgeries ready for corporate takeover and the restructuring of the NHS into US style integrated care organisations. My journey has taken me from street demonstrations to the corridors of power in Westminster. I have met patients, campaigners, MPs, health correspondents, current as well as former civil servants, health ministers, shadow health teams, parliamentary select committees, and party leaders. What has impressed itself upon me most is how few have really grasped the direction of travel. Policy has been increasingly concentrated in the upper echelons of the political, corporate and financial elite during the New Labour and Cameron eras. The culling of the civil service as a body of expertise has nullified institutional resistance. Instead, novice special advisors, often recruited from a tender age and/or seconded from corporate backgrounds, make up the backbone of the political party machines. The outsourcing of policy to think-tanks, the encirclement of Westminster by lobbyists, the revolving door between government and the private sector, and funding of the main parties all represent corporate capture of democracy and the privatisation of the state. The hollowing out of political parties, the mainstream media, the civil service and academia is one of the ghastly legacies of neoliberalism. It is necessary to rebuild the structures of civil society from the grassroots up. If history teaches us one thing, it is that only a broad-based mass movement can propel progress and save the NHS. The NHS cannot be preserved whilst the toxic effects of deregulated, free market neoliberalism continue to be unleashed. Far reaching, progressive change – from public services run by workers, citizens and communities, a green economy, the reversal of the death grip of financialisation, the democratisation of the economy, the dismantling of the offshore system as well as public investment and spending - will all be needed if we are to continue to have access to equitable, public healthcare. When I wrote my book, I did so as a concerned doctor disturbed by a government ideologically fixated on privatisation against the wishes of the British people overwhelmingly in favour of a publicly funded, run and owned NHS. Since then, my unexpected illness has only reaffirmed my resolve to fight, alongside many others, to guarantee the provision of universal, comprehensive healthcare free at the point of need. This is an edited extract from the new, updated and expanded edition of “How to Dismantle the NHS in 10 Easy Steps”, available from Zero Books.